Part of a series on local communities in SW Saskatchewan, this look at Maple Creek focuses upon its cowboy past and the efforts its residents have put into keeping their town vibrant without losing sight of their heritage. As befits The Old Cow Town with its roots in cattle, Maple Creek is branded with a distinctly western brand. Above the entrance to the downtown Heritage District is a metal sign reminiscent of the wooden ones found at the entrances to ranches in a John Wayne western. Along the top of the sign a cut-metal silhouette of wagons, horses and settlers forms a shadowed landscape of history against the sky. 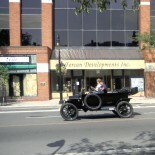 The Heritage District sports a street fully wide enough for two horse-drawn wagons to pass and is lined with old stone heritage buildings and western flat-front shops. 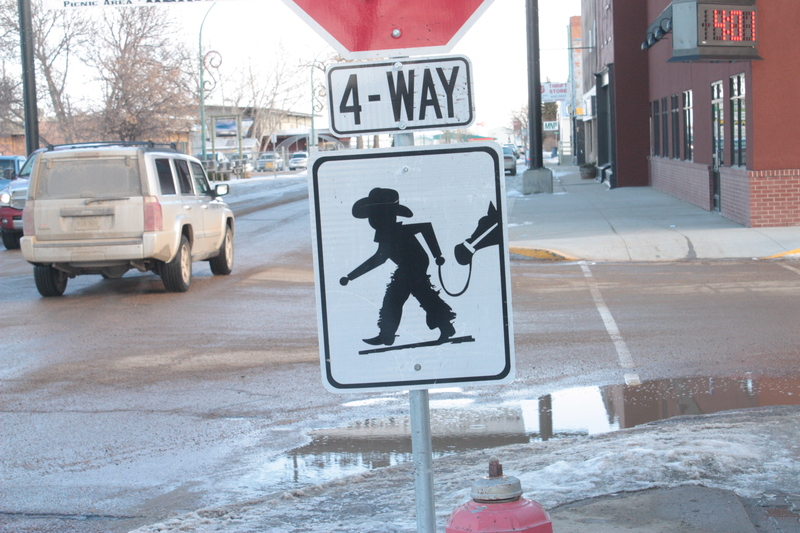 A sign for a horse crossing shows a young cowboy leading his horse, and the tops of the street trash cans are adorned with the silhouettes of cowboys and settlers. The Maple Creek brand is a strong brand, and its strength is legitimate. The town doesn’t simply have deep roots in cowboy culture, but shares in its continuing growth. On Sundays you can attend the wildly-popular Cowboy Church, where pancakes and worship are served up with a cowboy flair, and don’t miss the annual Cowboy Poetry Gathering and Western Art & Gear Show featuring two days of cowboy poetry, song, crafts and services. Considering the balderdash that generally gets written in vision statements, this one has heart and even a little poetry. It’s also true. Maple Creek’s past really is a “backdrop” to its present. Just look at the railway line at the top of the street. Train stops in these towns used to be social centres. They were places where people gathered to see each other off, greet arrivals, and even take in an exhibit on The Better Farming Train. Today, of course, few passengers are embarking or disembarking at Maple Creek. Nevertheless, a town map, a picnic area and playground next to the tracks provide a modern social context. And exhibitions of a sort still come through, such as this year’s visit from the Holiday Train featuring Doc Walker, Miss Emily and the Dube Brothers. Traditionally speaking, cowboys and Indians go together, and in this region the two groups have enjoyed a long and peaceful coexistence. This peacefulness, however, is tossed aside each year for the Battle of Little Big Puck. The idea for this was reportedly born in the minds of patrons of the Commercial Hotel in the ‘70s, and still retains the slight booziness such an idea would be expected to have. The Battle pits cowboys against Indians in a hockey game with its own unique traditions. 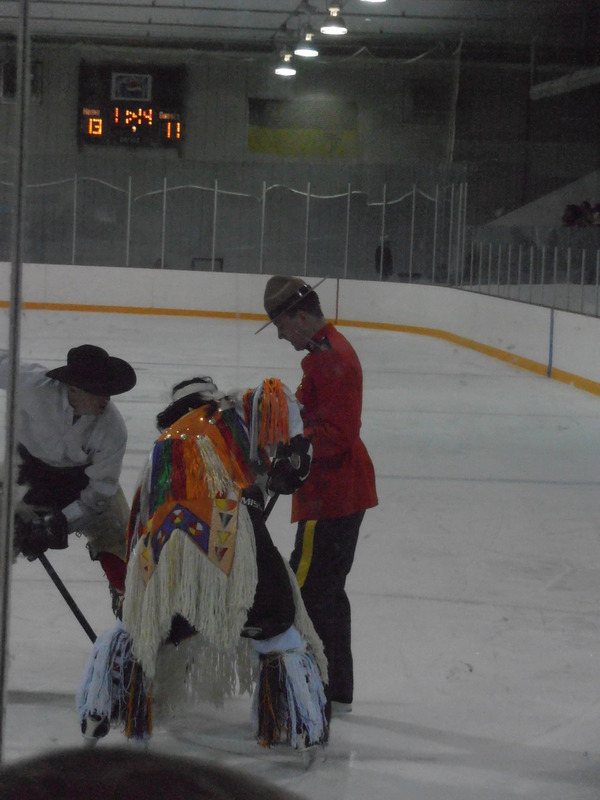 For the first two periods the cowboys and Indians compete while wearing traditional and stereotypical gear. The third period marks the costume-swapping tradition, and in the final minutes every skater swarms the ice in the free-for-all tradition. Speaking of traditions, the local museum is a tradition all its own. It’s presently undergoing renovations, but in a sense its story reflects that of the town itself. That same log cabin museum is now the oldest “purpose-built” museum in Saskatchewan: a museum built for the specific purpose of being a museum. There were several expansions over the years, but by the turn of this century “the additions and original museum were starting to show their age and deteriorate quite rapidly.” With the help of a sizeable donation by one of the members along with fundraising, the board is replacing the old editions with a new one. Hence, the museum has become an artifact in its own right. Much the same could be said about Maple Creek itself. Vibrant, winning both community and business awards, and with more truly great dining establishments than any town that size should have, it is also its own artefact, and very aware of its responsibility as such. Wow! The article about Maple Creek by Kit Simpson in your Feb. 12th, 2013 is incredible. Thank you so very much for the feature. It is very useful to get a visitor’s perspective on our community. It helps us better see what our visitors see. Although we recognize that we have a lot more work to undertake to fully realize our goals, feedback such as this is much appreciated and very encouraging.